This 5 week online-learning program educates parents on the leadership attributes necessary to guide children through the uncharted digital world. This transformative program could be the difference in making that one crucial decision that could either expose or protect your child in this digital age. You will learn: The challenges of raising a 3D child in a 2D world; how kids use devices differently to us and the gaps in understanding this creates; and how knowledge gaps impact the decisions you make … and more. You will learn: The key needs that drive children’s behaviour online. Discover what motivates them, understand what they’re searching for, learn how you can make more informed decisions … and more. You will learn: The next level of needs that can drive teen’s online behaviour; and the way you engage with them in the real world will influence how they behave online … and more. You will learn: Growing up with constant publicity and what your child’s digital footprint can mean in a digital world with ‘lasting memories’ where we feed the corporate bank accounts and the law is yet to catch up … and more. You will learn: How to confidently take back the reigns; how to control the first action in a chain reaction; how to rise above easy-to-break ‘device rules’; and find teaching opportunities through 12 key practices you can implement right now … and more! 24 practical activities are included for you to complete to gain the most benefit! 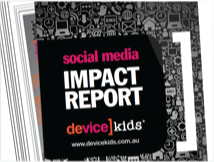 You receive the thought provoking deviceKids IMPACT REPORT immediately on sign up! 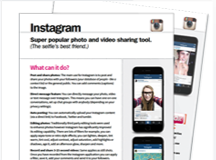 On week 2 you receive the BONUS ‘App Schmap!’ – a 32 page handbook on the most popular apps! Enrol in the online learning program today! 'just a parent'... they need a leader. • A 5-week paced learning program: Receive 25 easy-to-read sessions emailed directly to your inbox from Monday to Friday over the course of 5 weeks. • Discussion notes: Pointers, notes, quotes and considerations to help breakthrough “old school thinking”. • Practical activities: Gain a deep understanding of each session. 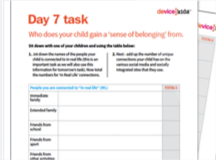 • Impact Report: Discover 6 THOUGHT PROVOKING INSIGHTS into how device usage is impacting children and parents – everyday. • ‘App Schmap!’: A 32-page handbook on the 10 most popular apps that kids are using! Will this program suit me? Yes! This program is for any parent who is raising a child in todays world. It builds understanding of the online communities inhabited by young people and provides easy and practical real-life strategies to use at home. Parents who have tried parental controls, spying or trapping their kids, ignoring the issue or hoping it will just work itself out, have found none of these are workable solutions. If you want to learn to lead, you have come to the right place. Does the program have to be done over 5 weeks? No, the program is yours to keep … HOWEVER we strongly recommend you ‘stick to the plan’ to keep you in the zone and maintain your momentum with learning. Like any education, gaps in learning create gaps in understanding. This program is designed over 5 Modules that takes you on an important weekly journey BUT … you get your weekends off! 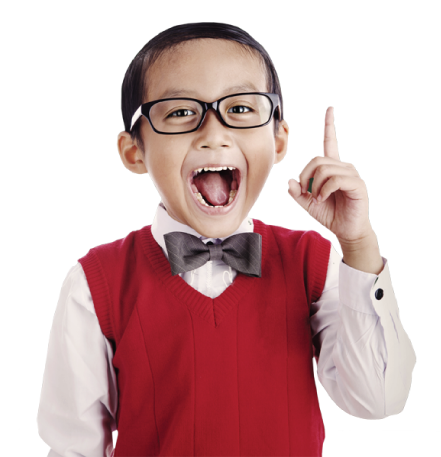 Well, starting on the first Monday, you will receive 1 session per day with an activity included so you can apply your learning. You will also receive a 32 page handbook on the 10 most popular apps you need to know about. You receive your session at 5am Australian time each week day and the sessions take about 30-45 minutes to read through. The activities take as long as you choose. Some people group their sessions on one day and others wait until the weekend to complete their activities … whatever works for you! Remember, the program is available to you 24/7. Just make sure you read your sessions in order! Is the program mine to keep? Yes! Each day you will receive a link to the session. If you want to save the session to your hard drive, simply download it and you will have it stored as a pdf which you can refer to later. What age range of child is this program designed for? The material focuses on kids from about 10+. For those of you with younger children, although the activities may not be ‘applied’ right away for your child, this program will advance your knowledge and expertise on this topic and will have immediate affect on the decisions you make. There is never a better time to be prepared than ‘today’. Are the session activities difficult? I get nervous when I have to do these types of things! No they are not difficult, a handful may be a little confronting but we do prepare you! Every activity is designed to be practical and relevant. You will find them easy to understand, do and of interest. Each activity prompts you to really think about the concept discussed and build upon each lesson learnt. Are any of these sessions anti-devices? Absolutely NOT. deviceKids are pro technology and pro education (as you could imagine!). 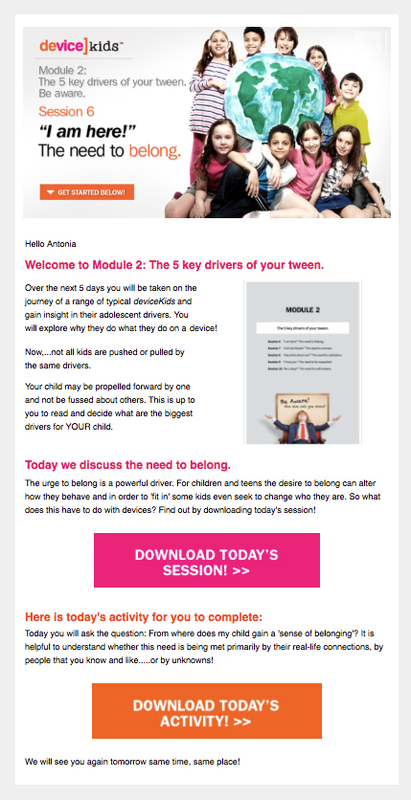 deviceKids is about educating parents on the leadership attributes required to tackle what they don’t know in the world where their kids live. Our ethos is that devices are fantastic tools with lots of benefits for all ages however they are not a lifestyle or productive “place” to spend all of your time. How do I cancel if I realise this isn’t for me? If this program doesn’t open your eyes, then we don’t deserve your money. Simply send us an email before Module 2 and we’ll give you back every dollar you invested. No questions asked. You will get a full, prompt refund and we’ll part as friends. This method of learning guarantees the maximum results in making you more equipped for the digital age. By the end of this program – if you have followed the deviceKids method – you will transform “old school thinking and doubt” into proactive and confident leadership. You will have an incredible knowledge of the path your children could walk down and even better, an understanding of ‘why’. You will have the strategies and insights to make fundamental changes to your family environment. This life-changing program is available to you at $197 and could be the difference in you making that one crucial decision that could either expose or protect your deviceKid. STEP 1: Enrol in the program and receive your Impact Report (unless previously downloaded)! STEP 2: Check your email on Monday – you will receive Session 1 of the program together with your first activity and your login details ready for download. STEP 3: Each week you will receive 5 Sessions, Monday to Friday. At the end of Module 1 if you don’t believe that you will gain massive value in learning about how the device age could impact your child with practical strategies on how to mitigate this, then we don’t deserve your money. Simply send us an email before Module 2 and we’ll give you back every dollar you invested. No questions asked! The time has come for parents to have access to a leadership program that will help them navigate their deviceKids through this new digital world – not confuse them! Be confident to navigate your deviceKid in the digital world! Payments are accepted securely online using our partner eWay.